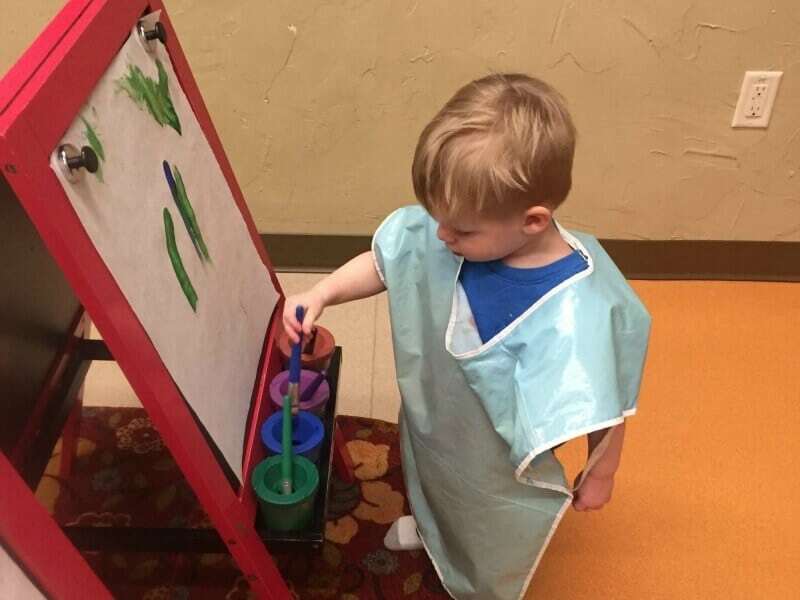 Local businesses and venues listed in this Birthday Party guide have paid to be listed, but each one has been recommended by Lake Country Family Fun or My Milwaukee Mommy readers. 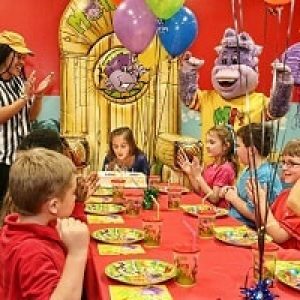 Where Should I have my Kids Birthday Party? We hear this question all the time and just love putting together this helpful, one-stop resource to help parents find the perfect party venue for their children. We are pleased to be bringing back our birthday party guide with our partnership with My Milwaukee Mommy! As moms, we know how hard and time consuming it can be to throw the perfect party. The more children we have and the more time that goes by, we realize the value of having someone else do the work…and relieve us of all that stress! 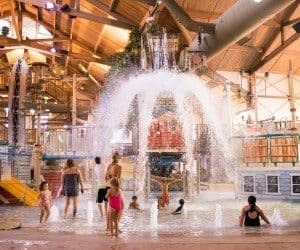 LAKE COUNTRY FAMILY FUN and MY MILWAUKEE MOMMY have received feedback from our fans of their favorite venues and reached out to some of the best local birthday party venues to create a lasting partnership with some of these local businesses! Take a look at the advertorial listing we have put together and consider having your party there! 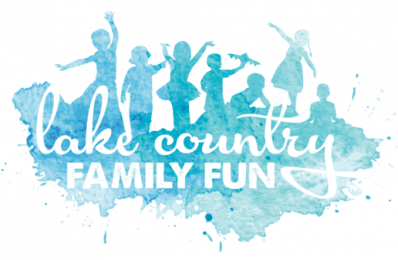 PLEASE MAKE SURE YOU LIKE LAKE COUNTRY FAMILY FUN ON FACEBOOK FOLLOW LAKE COUNTRY FAMILY FUN ON TWITTER, INSTAGRAM AND PINTEREST TO BE IN THE KNOW FIRST OF ALL THE FAMILY FUN IN MILWAUKEE AND WAUKESHA AREA! Don’t forget to help Lake Country Family Fun celebrate their 8th Birthday this year with an awesome family event. Details HERE. Save the date for April 7, 2019! Weekdays- $239 for 2 hours, Weekends $299 for 2 hours; an additional hour can be added for $39. 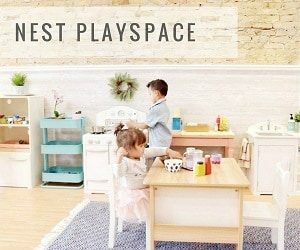 Nest Playspace is an indoor play area that focuses on imaginative play, and is modernly designed for children ages 6 & under. Parties are booked as private events so your group gets full use of the facility. Parties include: Up to 20 kids / 25 adults, choice of colors for tablecloths & balloons, setup, juice boxes, water, coffee, utensils, napkins, plates and personalized birthday sign. Please call 262-417-2871 for more info, or to book. You may bring any food/snacks/desserts for parties. oUR TOP BIRTHDAY PARTY guide VENUE HOT SPOTS! Come join us year round to run, climb, ride, slide, and have a blast at our indoor playground. 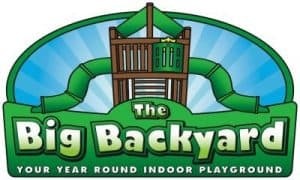 The Big Backyard brings the outdoors inside with huge play equipment, riding toys, balls, playhouses, infant toys, and more. We are also the perfect place to host parties and special events. Let us make your child’s party fun, easy, and one they won’t stop talking about. For more details on parties, click on the website link in the left column. We have multiple party packages ranging in price from $100-$387, the package is based on the total size of your group. Best for ages under 10. Included in the packages are organized games run by our hostess with the chidren, beverages, decorations, and all the paper products. All you need to do is bring the food and cake. We do all the set up and clean as well as helping with anything you need during the party to make it an easy and carefree experience! Roary the Tiger appearance: $20 for 20 minutes. Roary will come out for play and pictures, hugs and high-fives. Based on availability. Booking process shows available dates/times. Parties can range in size. Pricing is per child. Birthdays are a blast at Chuck E. Cheese’s®. What kid doesn’t want to celebrate at one of the best kid’s birthday party places around – a playland full of arcade games and delicious party food? With birthday games, birthday balloons, tickets and birthday goodie bags, your child’s special day will be one for the ages. We make it as easy as possible by taking care of the details so you can be part of what really matters—celebrating! Clap your hands and say “yeah!”— our world-famous live Chuck E. Cheese birthday show is a chance for the birthday crowd to get their groove on. Safety first! Our Kid Check Process ensures all guests who come together, leave together—keeping kids safe and giving parents peace of mind. The Corners flexible and spacious Community Corner is the perfect space for birthday parties for all ages! Bring all amenities of The Corners right to your party with the prefect location and unique on-site catering options including Sendik’s, BelAir, Cafe Hollander, Grimaldi’s, Goddess and the Baker and FreshFin Poke. Our Community Corner is designed for guests to make it their own and ensure a flawless event experience, whether it’s a group of 3 or 30. Do you want a personalized visit from your child’s favorite princess hero? Ask us how we will light up their face when you invite us to their special day! 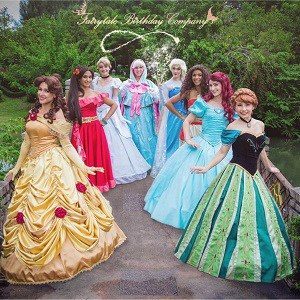 Fairytale Birthday Company LLC provides professional character entertainment for private parties, community events, and more. Proudly serving the Greater Milwaukee Area and Northern Illinois. Find us at local events as well! Let us worry about how to best bring the magic to you! Below we have crafted a few of our best party and event packages that are sure to be the perfect spell! Oconomowoc- 125 N Fowler St. 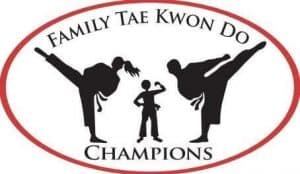 This awesome 1.5 hour birthday party includes basic tae kwon do skills and drills, a dance party, dodge ball, time in the party room, birthday child board breaking, and more! All you have to do is supply the food. An all inclusive package for 1-24 children is $450. Price increases if more than 24 children attend. Party package includes pool time for 1-24 children. Pricing increases if you’d like to invite more than 24 guests. Let Goldfish Swim School host your child’s next birthday party in our 90 degree shiver-free pool! Our special party package gives you two hours of private access to the entire facility, where the Goldfish team handles all of the setup, decor, and cleanup. Invitations, table settings, tropical decorations, cupcakes and beverages for the children are all included in the party package. Certified lifeguards are on duty to oversee the pool activities. All you need to do is show up, have fun and make memories! 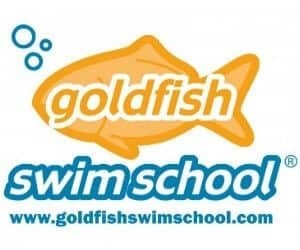 Find Goldfish Swim School on FACEBOOK! Read our Review of our Birthday Party at Goldfish Swim School, from the child’s point of view HERE. HAWS can host your child’s birthday party! HAWS offers two different Birthday Party Packages. The Basic Package includes cake and juice, games, prizes, a short tour of HAWS and animal interaction, all for $225.00! The Lunch Package adds pizza (up to 2 toppings) to the Basic Package, and is $275.00! Birthday Parties at HAWS last 2 hours, and an additional hour can be reserved for $50 for even more fun! 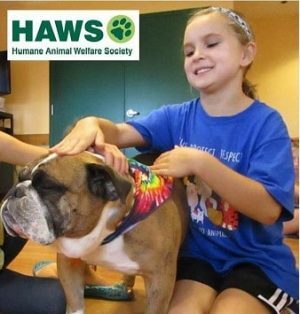 All proceeds go to furthering HAWS mission of taking in homeless animals and educating the public about animal welfare. To check on availability or to book a party, please contact Megan at 262-542-8851 or use the email link below. 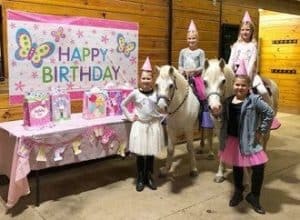 If your child is absolutely horse crazy, what better way to celebrate a birthday than with ponies? Pony Parties are appropriate for children ages 2 and up. Children will all get to ride and brush the ponies. Adults cannot ride the ponies. Horses are available at your request. Our Facility is heated and we can do parties all year round! We offer a large lounge area for cake and gift opening if needed after you’re done riding ponies. You may also have your tables right in the barn aisle if that is your preference. Click on the website button for package prices. Packages start at $165. Age range: Every age loves Kona Ice! 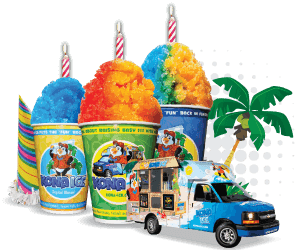 How cool would it be for the Kona Ice truck to make a special visit to your child’s birthday party? It can happen! At Kona Ice, we bring the party to you! All birthday party packages include 30 minutes of Kona party fun, flower leis and Kona Ice for up to 20 guests. The birthday child receives a goodie bag full of Kona Ice swag! Packages can include Regular or Color Changing Cups. Contact us for additional information. For party pricing, click on the website button below. Find Kona Ice on FACEBOOK! Visit our Lab in Franklin at 5010 W. Ashland way or We Come to you! Give your child a birthday party they’ll never forget. Your child will participate in totally cool science experiments with a certified Mad Scientist! Children will discover the spectacular side of science as they have fun with physics and witness cool chemical reactions! Discover objects that float through columns of air! Relish the mystery of fireworks! Watch in amazement as energy lights up a ball of plasma! See in wonder as water takes on an eerie green glow! And so much more! Take advantage of our hassle-free, safe and high-energy party packages. Parents will love the fact that Mad Science birthday parties are mess-free and hassle-free. Enjoy up to two hours of time in our party space, admission to the Museum, and best of all, the chance for your entire birthday bunch to interact with MPM! Experience real butterflies on a stroll through our indoor butterfly garden, discover the world of dinosaurs or take a trip back in time to Ancient Egypt. Monkey Joe’s is the destination for bouncing, sliding, jumping fun for kids in Waukesha! Kids will have a ball monkeying around our inflatable play area. Our bounce zone is filled with a variety of inflatable slides, obstacle courses, and bounce houses for kids 12 and under. Keep your kids active and happy with a day at Monkey Joe’s Waukesha.We take the stress out of party planning at our Waukesha party headquarters. We can host your birthday parties, team celebrations, school events, and group events for local families and organizations. We take care of setup, supervision, and cleanup. All you have to do is sit back and enjoy the joy on your kids’ faces! No physical location: She comes to YOU! Lan Liu is a Milwaukee-based henna artist specializing in contemporary designs. A self-taught artist with 20 years of practice, she has experience catering to groups of all sizes from schools, churches and festivals to intimate gatherings such as birthday parties and girls’ night in. She’s a mother of two who enjoys working with children, but her work is versatile enough to please people of all ages. She uses self-made henna paste made from fresh organic ingredients. Looking for something unique & fun for a special occasion or an intimate gathering of friends? 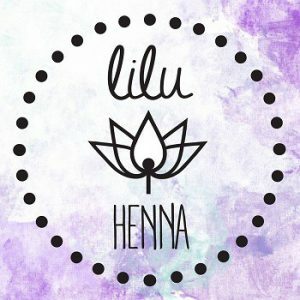 Consider henna at your next event! Please send a message to book an appointment or check availability. 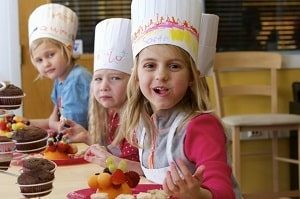 Kids birthday parties include a fun cooking project, paper chef hats for all guests, balloons, drinks, and cupcakes to decorate. We offer five different menus to choose from. Package A-$275: six guests plus the birthday child (7 total.) 1 1/2 hour party $25 each additional guest up to nine for this timeframe. Package B-$350: 10 guests plus the birthday child 2 hour party, also includes an apron for the birthday child to be signed by guests $25 each additional guest up to 30 total. Age range: We have parties for ages 3 to 12. We have 5 themed parties for boys and girls of all ages – Pretty Little Princess, Darling Divas, Sweetheart Spa, Ahoy Matey, and Superhero Squad. All parties include dress up to match the theme, an activity or party game, up to two spa services of your choice (Toe or Nail polish, Up-Do, hair syling or braiding, etc.). All parties include a take away craft such as a decorated picture frame with a picture of all the party participants. We also have a Build-a-bash party where we can customize a party for a specific theme or spa service! Your home or party spot. 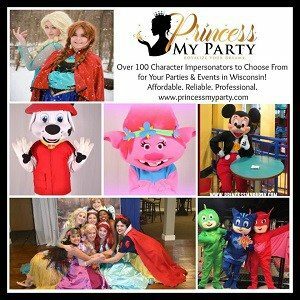 Over 100 costumed characters for rent for children’s parties/events. Princesses, Superheroes, Cartoon Characters and more! Singing & dancing, games, Face Painting, balloons, tattoos, preschool puppet show, preschool magic show, and more! Book early. Weekends fill fast. Registered. Insured. Reliable. Your daughter will love the pampering she receives with her friends on her special day. All parties are inclusive of invitations, paper products, party assistant and party area to serve food/cake. 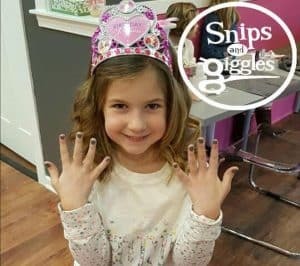 There are Princess Parties, Spectacular Spa Parties, Cover Girl Parties, Troop Time (for Girl Scout Troops), and of course plenty of fun add-on services, such as make-your-own sugar scrub sundae, make-your-own lip gloss, and make-your-own fairy dust! See our birthday fun there on INSTAGRAM! See our sneak peak into Snips and Giggles after they first opened HERE. Age range: 2-12 is the primary age group that we serve however birthdays in the water park are splashtacular for any age! Birthday parties at Springs Water Park are a splash! Kids of all ages love the activities the park offers and adults appreciate the variety of packages that are designed to fit their budget. Springs Water Park makes it easy to create birthday memories that will last a lifetime.For information on packages, please visit our website by clicking the link below. 2-12 is the primary age group that we serve however birthdays in the water park are splashtacular for any age! Find Springs Water Park on FACEBOOK! YOUR BIRTHDAY STAR AND THEIR GUESTS WILL SHINE AS THEY DESIGN, BUILD & CREATE with a whole new way to CELEBRATE! 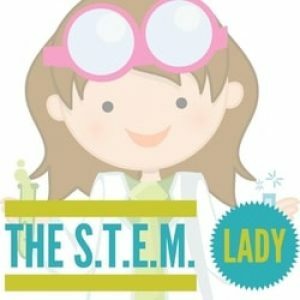 I provide a hands-on, creative experience for your child and party guests right in your own home by engaging them with opportunities to design, experiment, build and invent. Materials, instruction, and travel are all included in the cost of the party. 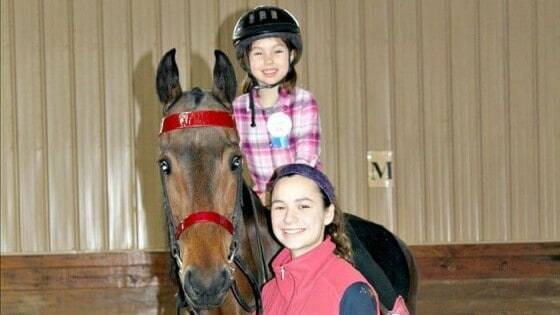 This is a one-of-a-kind experience that your child will SURELY never forget! StoneFire Pizza Co. offers SUPER birthday parties for the special hero in your life! 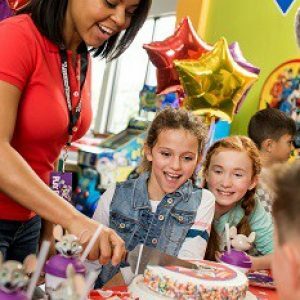 Choose one of three birthday party packages and relax while your own personal party host takes care of everything; from serving the pizza and cake, to doing magic tricks and face painting. After your 90 minute room time you’re off to the fun floor to enjoy THREE attractions and over ONE HUNDRED arcade games for as long as you would like! Now that sounds like fun! 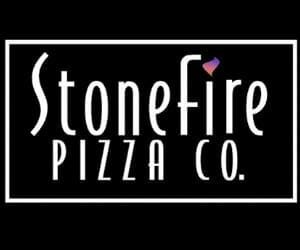 Find StoneFire Pizza Company on FACEBOOK! See Lake Country Family Fun’s review of a BIRTHDAY PARTY at StoneFire Pizza Company. Party packages start at $130 for Y members, and $160 for Community Participants. Packages include up to 20 kids. Each additional guest is $5. Leave the mess to us! 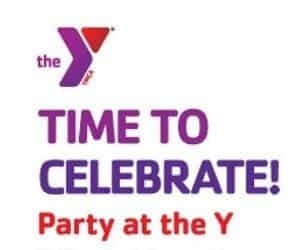 Have your next celebration at the YMCA at Pabst Farms. Party packages include 1 ½ hours of personalized fun in a party room. A host will be there to set up and clean up for you and facilitate all activities in the room. Party decorations and a t-shirt for the birthday child are also included. You may bring in your own food and drink. For an additional cost, you can choose to add on an hour in our family pool area or an hour on our rock wall. Try our Celebrate and Swim package for a birthday party, family reunion, scouting get together, etc. Start out in a party room for 1 hour, then move to the family pool for 2 hours of fun. *This option does not include a host or decorations. $100/hour for full size basket ball court and 60 x 120’ of turf space. $15/hr if you want a staff member to run activities. Looking for a fun place to celebrate? What a better place than theZONE! Bring in your own food, cake and beverages, (or for an additional cost, we can provide) and let the kids run and play. The party will be a HIT and you will have no cleanup! Party activity ideas: basketball, volleyball, football, kick ball, baseball, soccer, dodgeball, tumbling, or good ol’fashion tag! Find The Zone on FACEBOOK! The MULLETT ICE CENTER is a premier indoor skating facility providing a safe and fun atmosphere for skaters of all ages. We are located on Arrowhead high schools campus. We offer two different types of birthday parties a silver and a gold option. Click our link above to check out our website and FACEBOOK PAGE for more information. Each party guest will get a free skate pass! Uptown Art makes a great location for private parties. Host an event in our studio or we can bring the party to your location. Your private event includes: canvas, wood board or clay, paint and materials, art instruction, set-up and clean-up, and host will select the painting to create. Uptown Art will work with the host to select the perfect design from their extensive collection of paintings. Minimum Party of 6, discounts for 10+. Find Uptown Art Sussex on FACEBOOK! See their birthday party information on the website. Kids In Motion New Berlin: At Kids in Motion we make your child’s party easy for you and fun for them! We have several different options available to fit your budget and needs. Whether a simple no-frills option is right for you, or a party hostess with all the extras is what you want, we can do it. Our customer service oriented staff is friendly and excited to accommodate. Our packages start as low as $70 so check us out! Kids in Motion phone 262-649-3144. Need some birthday party kid gift ideas? Over 25 shop small shops for you to peruse to find local, unique gifts! We love shopping local! Our top favorite local shops for kiddos are The Purple Giraffe, Silly Willyz, Snips and Giggles, Books and Company, and Hush Little Lanie! Click the Shop Small image to see our full guide for local shopping! And once all the birthday planning and festivities are done…do you write thank you’s to those that attended? If you are looking for tips on helping your child write thank you’s for their guests, check out these 5 tips. Want to be included in this Birthday Party Guide for Southeastern Wisconsin? If you would like your party place featured in our roundup, feel free to reach out to the Lake Country Family Fun Team by clicking the button below. Our review of a birthday party at Goldfish Swim School in Brookfield. Our review of a birthday party at Equitate LLC in Oconomowoc.